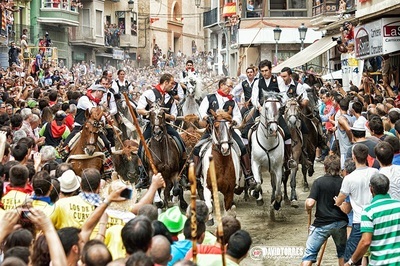 Fiestas - religious traditions that have become profitable tourist attractions and entertainment for the Spanish villages. 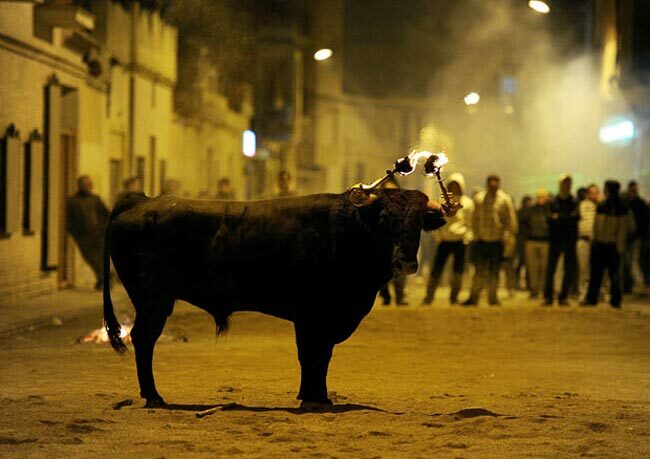 Most of these spectacle ends with bullfighting, where the bulls dies - the same day or during the fiesta. 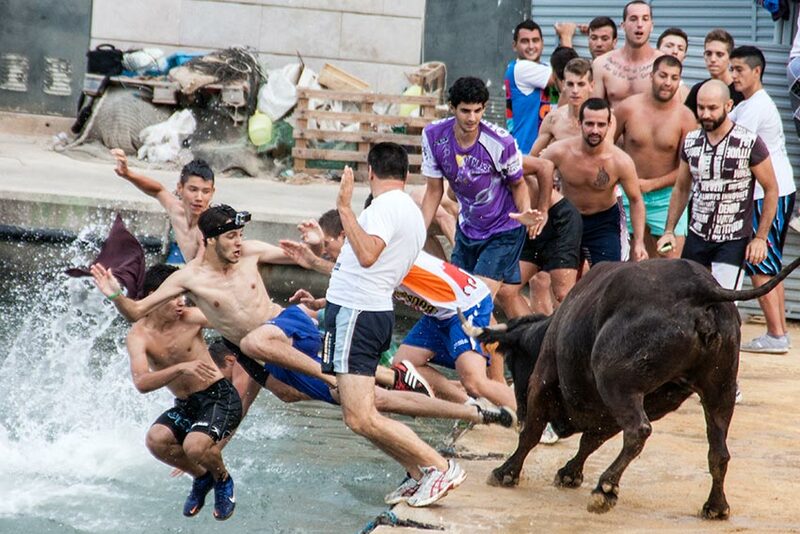 Bous a la Mar - (meaning "Bulls at the Sea") is held every year between the 3rd and 11th July in the town Denia, near Alicante, The highlight of this week long festival is watching bulls run down the main street Marqués de Campo, only to be chased into the Mediterranean sea by those daring enough to enter a makeshift bull ring with them. The festival is annually to commemorate the Day of the Sacred Blood of Our Lord Jesus Christ (el Día de la Santísima a Sangre de Nuestro Señor Jesucristo). 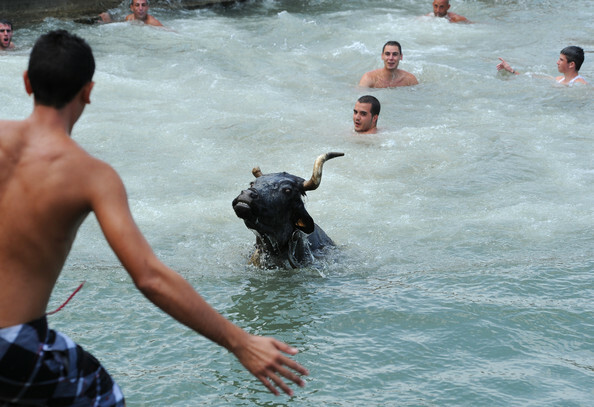 There can't be many Christian communities who choose to venerate Jesus Christ by holding a bull run in the local harbour. 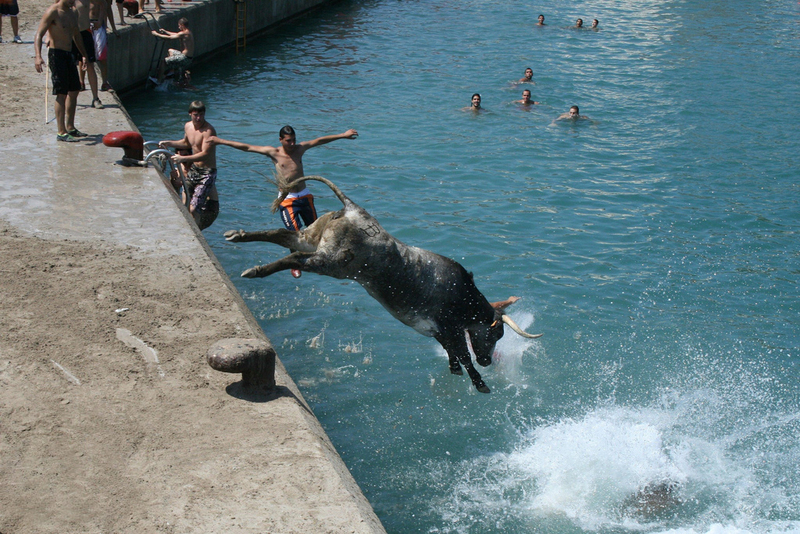 It's not the first time that bulls die either drowned or by other causes, also they are chased with sticks and kicked. 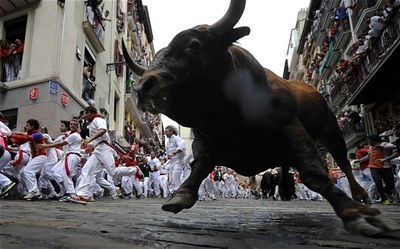 Originally, the festival was a religious feast, but it has since evolved into a spectacle more focused on the thrill of running ahead of the bulls to avoid getting trampled. Entrada de Toros - y Caballos de Segorbe Excitement and risk go hand in hand at this unique, spectacular celebration, which brings thousands of people to the village of Segorbe between 5 and 11 September, year after year. 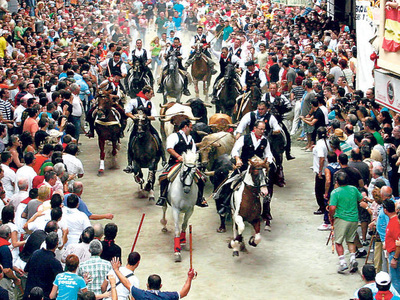 The Droving of Bulls and Horses takes place during the second week of the patron saint’s fiestas in Segorbe. This traditional act, whose origins date back to the 14th century, takes place at 2pm every day during the week (Monday-Sunday). 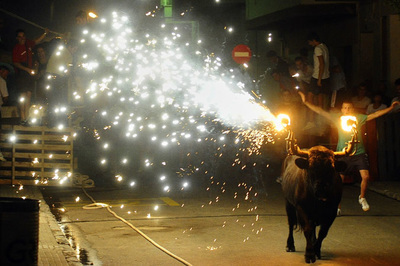 A rocket is fired off at exactly two o’clock, marking the start of the droving in Calle del Argén street. When the herd of bulls gets to Plaza de los Mesones Square, a group of daring riders collects them and surrounds them with their horses, to guide them to the bullring in a fast, dizzy race that lasts barely two minutes. The route runs some 500 metres along Calle Colón Street. The crowds of spectators do not get in the way. The sea of people opens and closes, creating a moving passageway as the bulls move forward. On their way, those in attendance reward the courage of the riders with jubilant shouting, in the midst of an amazing atmosphere. The programme of the fiestas is completed by numerous acts such as open-air celebrations, concerts, competitions and fireworks. Often slipping the Bulls on the hard surface and becomes injured, many horses are also gunned down by the bulls and get severe injuries and must be killed. Fiesta del Toro Embolao - Each year in January, The Fiesta del Toro Embolao occurs in Gilet, Spain. During the Toro Embolao, revelers try to attach burning balls to the bull's horns while the animal is tied to a pole. 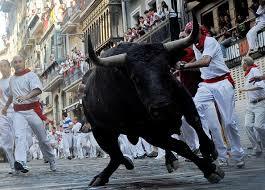 Then revelers begin to untie the bull for it to chase them through the streets. The practice is highly controversial. 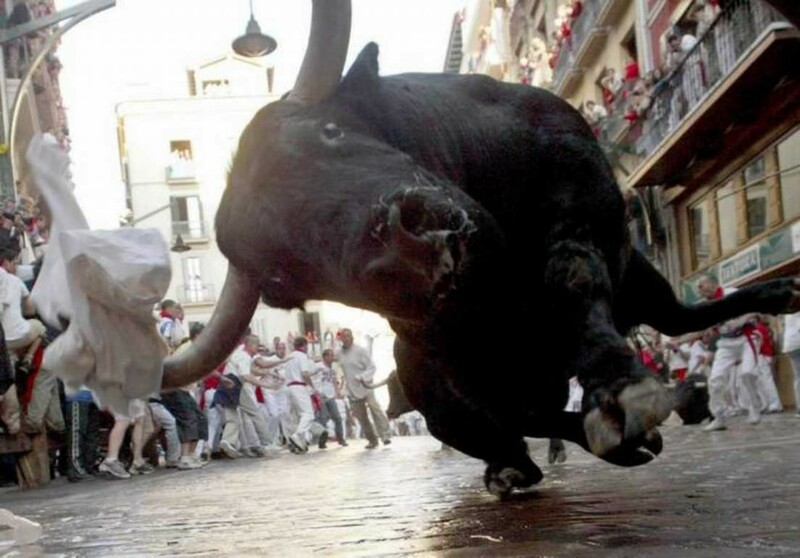 Animal-rights activists claim the bulls are harmed for entertainment. The area of increased activity and lore includes the provinces of Castellón and Valencia in Valencia. The province of Tarragona in Catalonia and some towns bordering the former province of Teruel, is currently being tried to intensify the regulation of such activities, linking them under the label of Bous al carrer or correbous (Bulls street). The Bulls on The Street, al Carrer or Correbous Taurine is a popular type of party that is practiced in many villages of Valencia and the Ebro, especially in the regions of the Marina Alta, the Alto Mijares, the High Palancia, the Lower and Upper Maestre. In north of the High Plain, the Lower Plain, the lower Ebro, the Montsià and Terra Alta. It is typical to loose cows, which is the same but using cows. While it can be done any time of year, usually coinciding with the celebrations and most are made ​​in August. 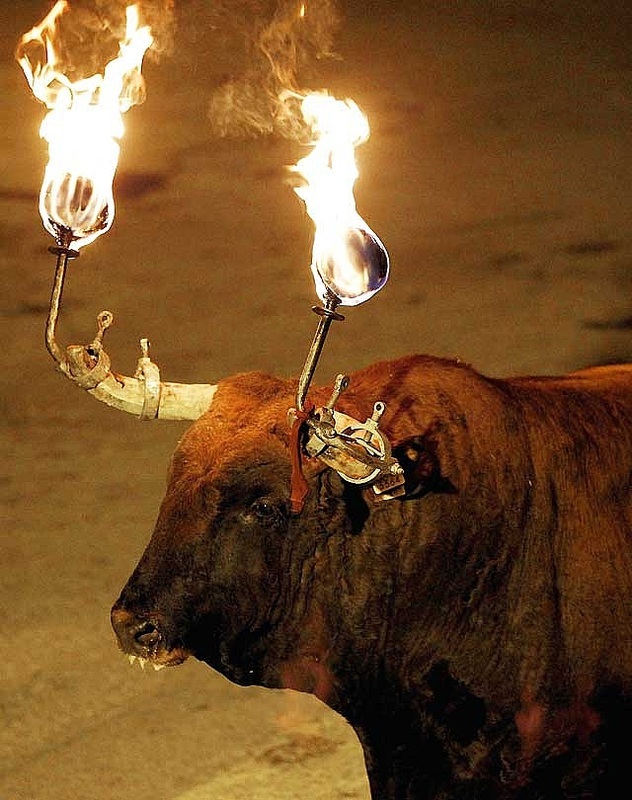 In other regions there are similar festivals as the Bull of Carignan and surrounding Ronda in the province of Zaragoza, or the Toro de la Vega Tordesillas, Valladolid. This festival is celebrated mainly at dusk or at night. 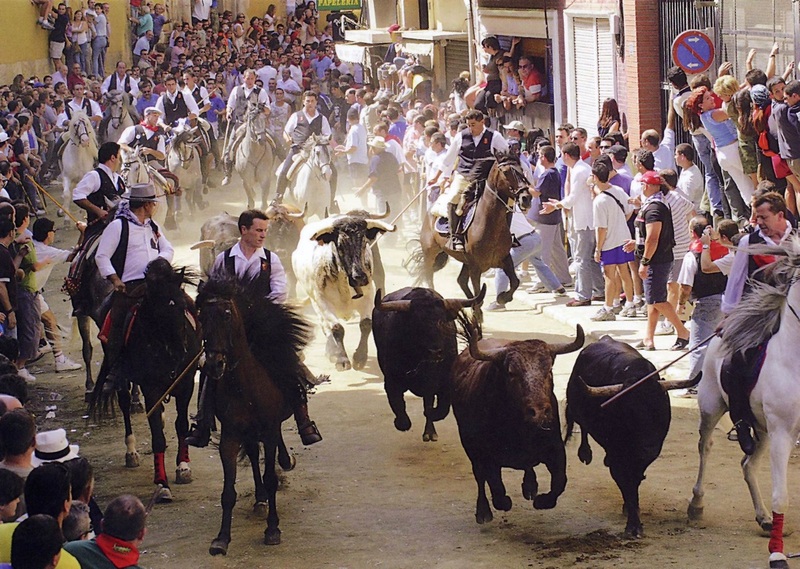 Cuerda Torico - The Bull Rope - or the Cuerda Torico, is a party Turís (Carr), Shiva, Godelleta (Buñol FOIA) and other towns in the area. The festival is a variant of the bullfighting Mediterranean where, like the bull on the street, in this case, the goal is to bring the bull, or Torico by the Spanish Aragonese, for several houses in the town, always on a leash. 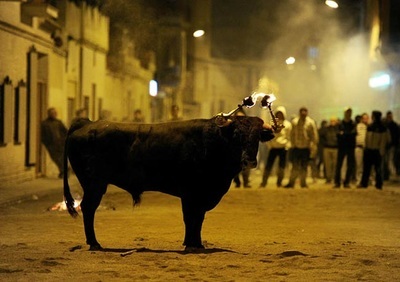 In 2010, the Catalan Parliament passed a motion recognizing and protecting these celebrations, referred to generically correbous, which contains a sort of code of good practice, all shortly after in the region have banned bullfighting Spanish traditional. A Rapa das Bestas - This fiesta dates back to the 15th century and is held every year in the first week of July. It comprises a noble confrontation between man (read, stupid people and drunken tourists) and horses. At the celebration, young people from Sabucedo and the surrounding area (Pontevedra province, Region of Galicia) head for the mountains at dawn. Their aim is to find wild horses living in the area, bring them back to the village and cut their manes. When night falls, they all come together to enjoy food, music and wine. 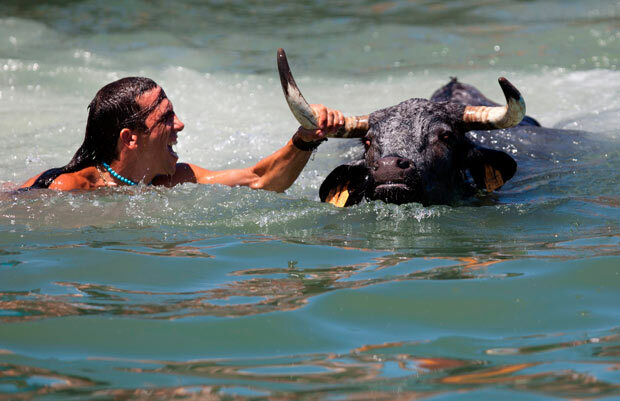 Each year, the Rapa das bestas festival in Sabucedo attracts more and more visitors on account of the spectacular, noble nature of this battle between man and beast. The young men divide up into groups and head for the mountains in search of horses. When they find them, they surround them and drive them back to the village. Finally, they get them all together and begin cutting their manes. For this, two "aloitadores" (the young men who do the cutting) place themselves at the head of the animal, and one more at the tail. First, one of those at the head tries to mount the horse while the one behind tries to imbalance it. Then, the second "aloitador" at the head tries to do the same, forcing the first one to get off. These are the complicated manoeuvres used to cut the animal's hair in a real body-to-body fight. 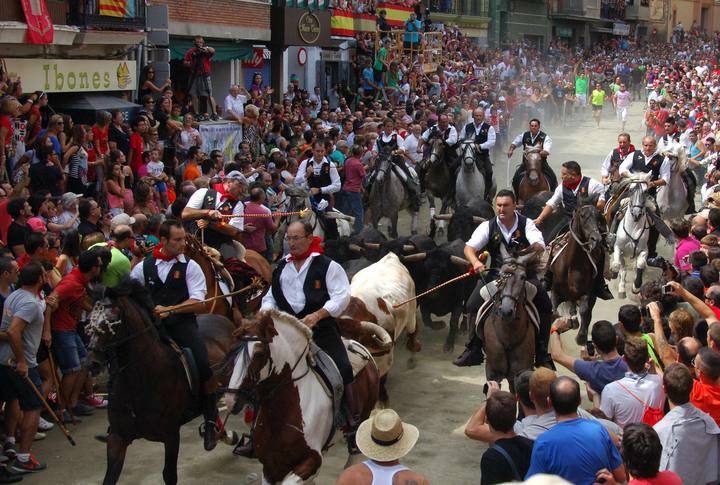 And this is just a handful, shown here, of all the surviving cruel traditions that takes place all over Spain - still in this century.